Le Maschere Tradizionali, the traditional carnival stock characters, are impersonations of “human types” in a caricature style. Until not long ago they were the main source of inspiration for carnival costumes. When I was a child, I remember that around carnival time, I would go with my mum to some fabric shop and haberdashery to buy all my grandma needed to make a costume for me. I remember some really cool princess-style dresses, especially a yellow dress with a large tulle skirt with colourful cloth flowers, which I wore many times after that year’s carnival party! What I also remember, though, is that 30 years ago traditional carnival stock characters were the main inspiration for costumes. I think they are not so common anymore: now kids seem to prefer superhero costumes and the like. Le Maschere Tradizionali, the traditional carnival stock characters, are impersonations of “human types” in a caricature style. They originated in the 16th-century tradition of the Italian Commedia dell’Arte (the Comedy of Art), “a professional form of theatre that began in Italy in the mid-16th century, and was characterized by masked “types,” the advent of the actress, and improvised performances based on sketches or scenarios”. Pulcinella – a white outfit, a funny pointed hat and a black mask with a big nose, Pulcinella is the traditional Neapolitan carnival character. He’s chatty, a bit crazy and very lazy! He has a mandolin, he likes to sing and eat and sometimes he hits the other carnival characters with the long stick he always has with him. 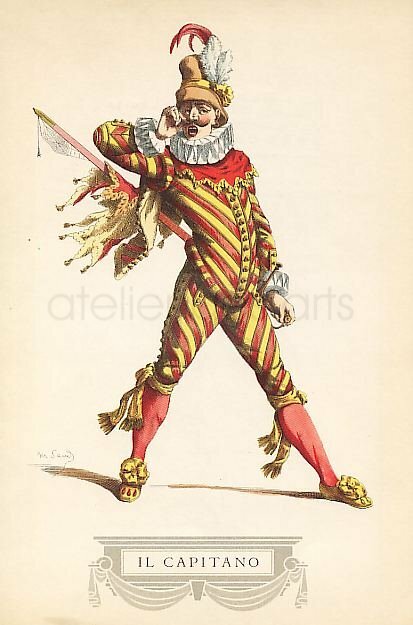 Arlecchino – he was my favourite! Also known as Harlequin in English, he has a colourful outfit, a large hat and a black masque. He’s a mischievous servant, a bit of a scoundrel and swindler, but, deep down, he’s wise and good natured. His girlfriend is Colombina. 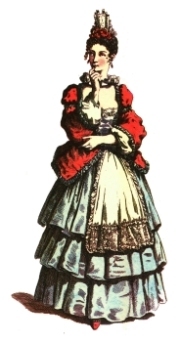 Colombina – or Columbina, is the only girl among a crowd of male carnival characters. She’s a lively and smart young female servant. She is pretty and a bit of a liar and she speaks in the Venetian dialect. She loves her young Lady Rosaura very much and she goes out of her way to make her happy. She has a white and blue dress and a large flounced skirt. She makes fun of everybody: a flirtatious and impudent character! Pantalone – also a Venetian character and the victim of Columbina’s intrigues. He wears a red suit and a black mantel. He’s grumpy, stubborn and annoying. Pantalone doesn’t like spending his money: he’s a very tight, old Venetian merchant who complains all the time. Dottor Balanzone, or the Doctor – he’s from Bologna and he’s all dressed in black, and has a book under his arm. He’s angry, disruptive and he doesn’t listen to anyone else from any of the fields that he claims to know about (which are many). He is pompous, and loves the sound of his own voice but he often talks nonsense. Gianduia – he’s the traditional carnival character of Turin. He’s a witty, funny and smart peasant who is actually called Gioan d’la douja (literally, Giovanni of the wine – douja in the local dialect) because he goes to all the bars in Turin and ask for a glass of wine! Gianduia has a girlfriend, Giacometta. Brighella – he’s from Bergamo. He has a white and green outfit. He’s a masterful liar, a smarter version of Harlequin. He’s funny and cheeky with women. His name comes from the fact that he’s a fire-eater. Brighella can play and sing and he knows how to party. Rugantino – he’s from Lazio. He’s dressed up as a gendarme and he’s arrogant, big-headed and cruel. He’s also a fire-eater. Stenterello – he’s from Tuscany. He has a distinctive blue jacket with chequered red and white wristband. He’s generous, smart, wise and optimist. Scaramuccia – also known as Scaramouche, is a roguish clown character who wears a black mask and black trousers, shirt and hat. He is usually portrayed as a buffoon or boastful clown. He’s from Campania. He’s lazy and he gets beaten often. He’s big-headed but he is often quiet. Capitan Spaventa – or the Captain, is from Liguria. He has a yellow and orange suit, a hat with feathers, a long mustache and pointed beard and he carries a long sword that he drags around making a lot of noise. He fights his battles with his witty speeches. Sandrone – he’s from Emilia Romagna. He has a red hat and a green jacket. He has a ruddy face and he really loves wine. He’s an ignorant but smart peasant. An yet it is very rare to see people in traditional costumes nowadays. Too bad!